The Cosmetic Laser Warehouse repair hundreds of Syneron lasers and handpieces each year saving our customers time and money. Our technicians are experienced and certified in the laser repair services. We carry a full inventory of Syneron components and parts due to the volume our repairs we make. Standard turn around times for most equipment is: 2 – 3 days. OEM parts in stock for FAST turnaround times! Honest Evaluations on whether it is More Cost Effective to Repair or Replace your unit. Handpieces: AC,DS, DSL, LV, LVA, Matrix IR, Matrix RF, Motif HR Plus, Motif LHR, SR, SR Plus, SRA, SRA Mini, SRA Plus, Sublative Rejuvenation, Sublime, ST and WRA. 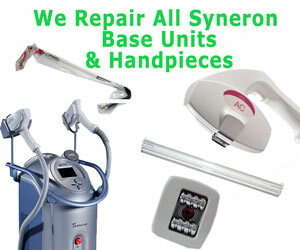 We can repair any Syneron Laser including the eMax, eLaser, eLight, Galaxy, Aurora, Comet, eMatrix, elos Plus and more. Don’t hesitate to contact the Cosmetic Laser Warehouse today if you are having issues with your Syneron laser or handpiece. Our expert technicians will gladly troubleshoot your issue over the phone and provide you with a free estimate to repair your equipment. Repair and or replace circuit boards.